Pompeo Sworn in as US Secretary of State after Senate Confirmation. 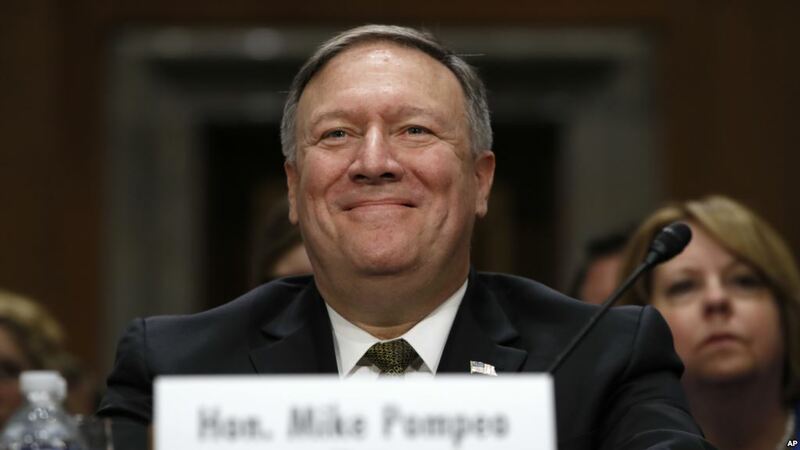 Former CIA Director Mike Pompeo was sworn in as U.S. secretary of state Thursday after a divided Senate voted 57-42 to confirm President Donald Trump's nominee, with all Republicans backing him and all but six Democrats and one independent lawmaker opposed. Trump hailed the confirmation and congratulated Pompeo on becoming the 70th person to be named America's top diplomat. "Having a patriot of Mike's immense talent, energy and intellect leading the Department of State will be an incredible asset for our country at this crucial time in history," the president said in a statement. Pompeo replaces Rex Tillerson, who was fired last month by Trump. His assumption of duties allows him to attend a NATO meeting Friday in Brussels, and hold bilateral talks with Turkish and Italian foreign ministers. The new secretary of state then heads to Israel, Saudi Arabia and Jordan. State Department spokesperson Heather Nauert said the stops were chosen to reflect their "importance as key allies and partners in the region." The trip comes just hours after a contentious confirmation vote in the U.S. Senate. While Republican lawmakers were united behind Pompeo, most Democrats bemoaned what they saw as the nominee's history of warmongering rhetoric and antipathy to Muslims and gay people.